Today I am reviewing a very different kind of book. It’s neither a novel nor a writing guide, but actually a scientific book written by Chris Brawley and released last year by McFarland as volume 46 of their series Critical Explorations in Science Fiction and Fantasy. It’s a very interesting book. If you can read it. This is at times pretty heavy stuff. Being an American academic book, the way it is written and the content explained is relatively easy to follow. It’s nothing like German academic books where it often seems like the authors are trying to write in code to prevent the contents falling into the hands of the uninitiated and being released to the general public. (It’s easier for many German students to read American academic books in English than German academic books in German.) But knowing its audience, it does rely on a good amount of preexisting familiarity with the field and jumps straight into the deep end. Someone who is not familiar with many of the technical terms might possibly miss more than half of the information presented in it. But first semester students manage. If you really want to know what this book has to say on its subject, I very much recommend giving it a shot. Even if you don’t understand half of it, the other half might still be quite eye opening. While many writers of fantasy and their readers aproach their works as adventure stories with magic and strange creatures, some see their own works not only as entertaining diversions, but have the aim to create stories that are “eye opening” and get the reader to think about their everyday world in a different way. Not simply to change opinions, but to see more, think more, and feel more, and to experience the world and life as more than just rational facts. 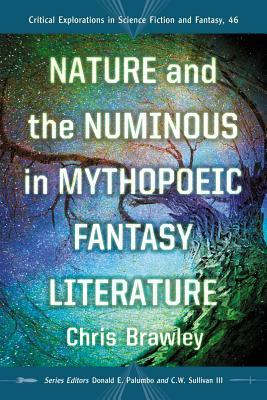 Brawly quotes Tolkien that “what fantasy does is to help lift that “veil of familiarity” and allows us to “clean our windows” so that we see the world clearly, and religiously.” Other authors that are examnined in this book are C.S. Lewis,Samuel Coleridge, George MacDonald, Algernon Blackwood, and Ursula Le Guin, which is a quite homogenous group as the author admits himself, with Le Guin specifically included to provide some contrast. But since the topic of the book is quite specific, concentrating on a quite narrow segment of fantasy fiction is not a serious disadvantage. His point probably comes across much clearer than if he would examine a very broad range of highly different writers and works. I came across this book entirely by accident while looking for any possible pieces of writing advice regarding religious elements in fantasy, since I’ve long been feeling that most fantasy I’m seeing is somewhat stale or even sterile when it comes to being “magical” and “wonderous”. At some point this book title showed up among the search result and with my background in cultural and religious studies recognized it as being exactly about the kind of thing I was trying to get some insight on. Even though none of the authors examined in this book are of the kind I usually read. And though the book is not about writing advice at all, I found it extremely helpful for my own purpose. One of the big points made by the book is that both Christian thought and Western Enightenment are centered around the basic assumption that there is a clear distinction and separation between humans, the divine, and nature. If the divine does exist, humans are not part of it. Humans are also not part of nature. They look at nature from the outside and maipulate it for their own benefit or accidentally causing damage that will become a problem to them in the future. And this position is highly criticized by the examined writers and their stories often tend to tear down these distinctions and seprations. In their stories, humans are part of nature, and both humans and nature are part of the divine. And frequently play very important roles for the fate of the gods and the universe. The Lord of the Rings is always a good example, not just because it’s so well and widely known. In the world of Middle-Earth you have the ents, who are both like humans and like trees. And there are the eagles, who are animals that can talk and also clearly have some strong connection to heaven. In The Hobbit, you also have a man who is both a human and a bear. And of course there’s also Gandalf who has a human body and lives among humans, but also is divine in nature. Or the elves who are both like people and also at home both in our world and in heaven. Tolkien blurs the lines of what is human, animal, plant, or deity. There are no borders between them, only gradients. And this unification of human, nature, and divine certainly fits the concept of the numinous. An increased awareness of the universe as a single whole. 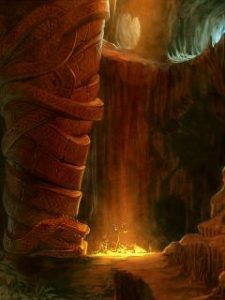 I always wanted to create stories with a strong presence of a Spiritworld and cultures that see their world in an animistic way. Reading this book helped me quite a lot in understanding how that might work in practice. This books is certainly not for everyone. But if you have some interest in the subject and get an opportunity to flip through it, I very much recommend giving it a look. Wow, Martin! I didn’t know there was a book like this. Thanks for the review. I’m amazed at how you and I have similar concerns and interests regarding fantasy literature.